Last year we had the honour of awarding the Studio Nine Architects Design Excellence Award to one talented and deserving student at the University of Adelaide Final Year Architecture Exhibition. The prize was the first of its kind, with the recipient winning a two-week paid internship in our studio. 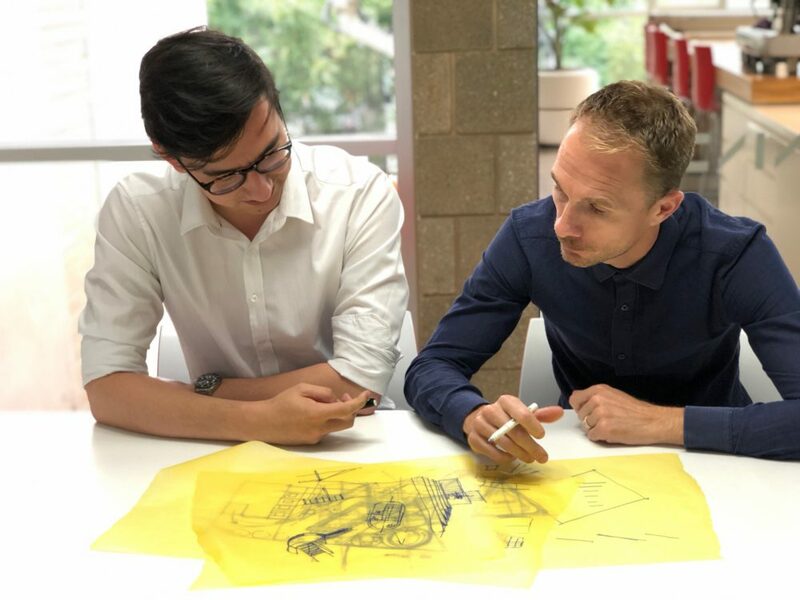 We sat down with the deserving recipient, Aiden Moon, and our Senior Associate, Nigel Howden, to chat about his experience after finishing his Masters and gain his valuable advice for future architecture students. Tell me about your final presentation / project. Aiden – My final project was more research based than practical. It was a cruise ship terminal whose form was derived from the star navigation that sailors used. It was different in that I pushed for my project to work as a ‘tool’, not just being inspired by a certain practise or place. Nigel – The quality of Aiden’s design thinking, communication and his final presentation was of a high quality. Having a good idea is one thing but being able to succinctly communicate that idea to a wider audience is a definite skill and one which Aiden clearly possesses. How has your time been at Studio Nine Architects, what have you been working on? Aiden – It’s been a fantastic experience, I’ve loved the studio environment. I mentioned to Tony (Director) on my first day that I wanted to use Revit as much as possible to build up my skills and understanding of the program. Using Revit, I’ve been working on the sketch design of three hospitality redevelopments for venues around Adelaide, designing and then creating and editing models. I’ve worked with, and learned from, a variety of people in the office, all with different perspectives, ideas and strengths. Aaron and Rimas have been really helpful in assisting me with the technical aspects of my role and the Directors Tony, Andrew and Mandy have willingly shared their expansive knowledge and wisdom. What have you found to be the biggest difference between university and working at S9? Aiden – University is more conceptual, you focus on ideas of space and form. Here at S9, it’s all about materiality and the nitty gritty – “how stuff stays up”. Working on the sketch design phase of a few projects I’ve been able to have input and develop some of my own ideas. My colleagues have been clear and honest with their feedback and they let you know if something doesn’t work, explaining the reasons why which has been a really valuable learning experience. Nigel – The value that we can offer graduates is in being able to offer constructive criticism and clearly articulate why certain design options may not work, whether that be for aesthetic, commercial or buildability reasons. Is this what you thought life out of university would be like? Aiden – I felt like there were going to be ten extra steps I would need to take before actually getting into the workforce and working in a real-life studio environment. I feel like university has perhaps prepared me better than I thought it had. I certainly still have a lot more to learn, especially in terms of the design process and the pace of working. At university you have a month to take your basic idea from concept to an actual plan and model, whereas in the ‘real world’ you don’t have nearly as long. At S9 I’ve been given project work from the outset which has been a really great experience. What advice would you give to current Architecture students? Aiden – Firstly, learn Revit. It’s an industry standard and now is a great time to learn while you have access to tutors that can guide you. Secondly, look after yourself. Don’t worry about what other people are doing and do what works best for you. I found setting short term, achievable goals, really worked for me. Nigel – It’s important to gain experience in the industry to bridge the gap between university and entering the workforce, to make the transition smoother. Understanding the value of your time is a key learning point for new graduates, and not always something that is explained to you, particularly in larger companies. With Aiden we have made a point of this with him from day one so that he can gain a better appreciation for how projects are run and businesses operate. Aiden – This internship experience has positively reaffirmed a lot of things for me. Most importantly it has confirmed that I chose the right course. S9 has provided me with a great opportunity to experience a working design studio and to work on actual projects with real clients and very real deadlines. Nigel – The fundamental intent, and hopefully value, of the internship is to offer graduates an insight in to the commercial workings of our thriving studio and to experience first hand the delivery of project work in a team environment. The Studio Nine Architects Design Excellence Award will be chosen by Senior Associates Nigel Howden & Keith Dougal again this year at the 2018 University of Adelaide’s Final Year Exhibition. Good luck to all students!